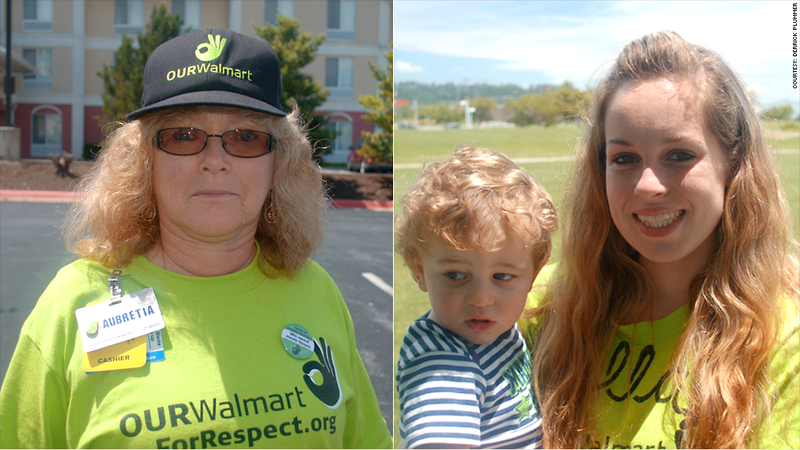 Aubretia Edick (left) and Amy Stinnett are both Wal-Mart employees who rely on taxpayer-funded government programs like food stamps and public healthcare. Amy Stinnett works as a cashier making $10 an hour at the Wal-Mart store in Placerville, Calif. It's not enough to make ends meet for the 21-year-old single mother. Stinnett and her son are on MediCal, the California Medicaid program. She relies on food stamps for her son, and borrows money from her family to buy diapers and pay rent. That's because in the last six months, Stinnett has been scheduled to work 20 hours or fewer a week, which isn't enough to qualify for Wal-Mart benefits. "I'm barely scraping by with what I make," she said. "I have no money whatsoever for emergencies." The cost of low wages at Wal-Mart (WMT) are at the center of a new report released last week by the Democratic staff of the House Committee on Education and the Workforce. Low wages are an issue across the economy, but Wal-Mart, as the country's largest private employer, has long faced closer scrutiny than other companies. According to the report, the cost of Wal-Mart's low wages isn't just felt by workers like Stinnett, but also transferred to American taxpayers. The report zeroes in on Wal-Mart in Wisconsin. That's because the state releases information on how many workers are enrolled in its public health care program broken down by employer. At the end of 2012, there were 3,216 Wal-Mart employees who were enrolled in Wisconsin public health care programs, more than any other employer. Add in the dependents of Wal-Mart workers and the total jumps up to 9,207. Factoring in what taxpayers contribute for public programs, the report estimated that one Wal-Mart supercenter employing 300 workers could cost taxpayers at least $904,000 annually. Wal-Mart spokesman Kory Lundberg said that the report uses data from a single state to overgeneralize. Low wages are one of the reasons dozens of Wal-Mart workers are protesting outside the company's annual meeting, which begins on Wednesday at the retailer's headquarters in Bentonville, Ark. Stinnett is joining the rally, which was organized by OURWalmart, the union-backed organization that helped stage nationwide protests last year on Black Friday. The group has been asking Wal-Mart to end what it calls retaliation against speaking out for better pay, fair schedules and affordable health care. 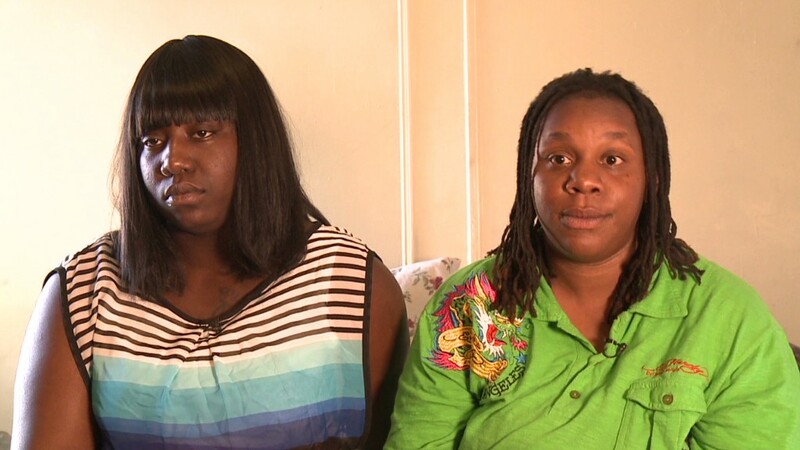 Aubretia Edick, who has worked at Wal-Mart for nearly 13 years, will also protest Wednesday. Currently a cashier at a Massachusetts store, Edick has been relying on food stamps, state health insurance plans and assistance in paying her heating and electric bills for the last five years. She said she is asking Wal-Mart to pay its employees higher wages, give them better hours and listen to its workers. "We want respect," she said. "We want to be able to earn a living wage. We want to be treated like human beings." Wal-mart workers, who are able to qualify for benefits and work longer hours, are able to do better. Noemi Flores has been working at a Wal-Mart in Persall, Texas for 27 years. When Flores started as a part-time cashier, she relied on public health care and food stamps for her two sons. But in 1990, four years after she first joined, Flores was eligible for Wal-Mart's health insurance and was able to support her family without public aid. "The fact that I was able to do it on my own and not need help meant a lot to me," she said. "I plan on working at Wal-Mart until they wheel me out of here."